Enter the Rift Raid to defeat the Chaos Beast Khi'zar Kha'jul with no Energy! 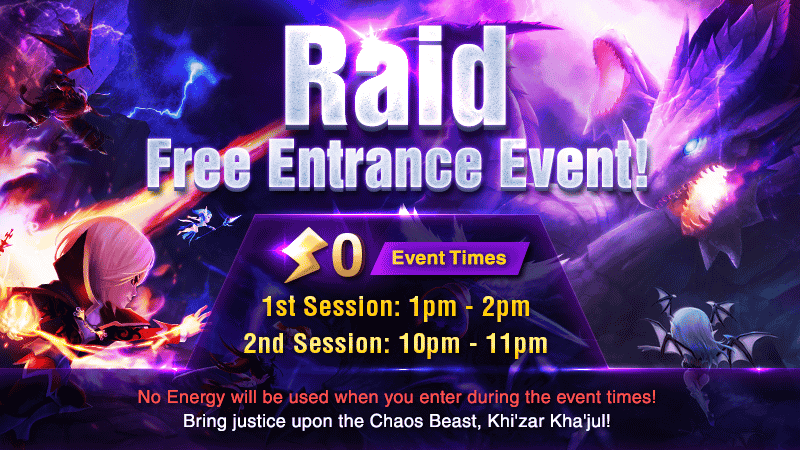 Please check out below for more info on the Rift Raid Free Entrance Event! ▼ Event Details: No Energy will be consumed to enter the Rift Raid battles of all levels during the event. * The event applies to the Rift Raid only. : Raid decks of your friends and Guild members can be used as support decks! : You can get support up to 5 times a day. : Go to Raid > [Invite] > select a friend or a Guild Member > Tap [Support] Button to get support. : Tap and hold a Summoner's info to see what kind of raid deck the Summoner possesses. : You can't receive support from the Summoners who haven't saved their first raid deck.